Heifer Tanzania camel project beneficiary Timothy Sheghere Mgonja's mother, Sifa, is 91 years old in a country where the average life expectancy is the mid-50s for both men and women. 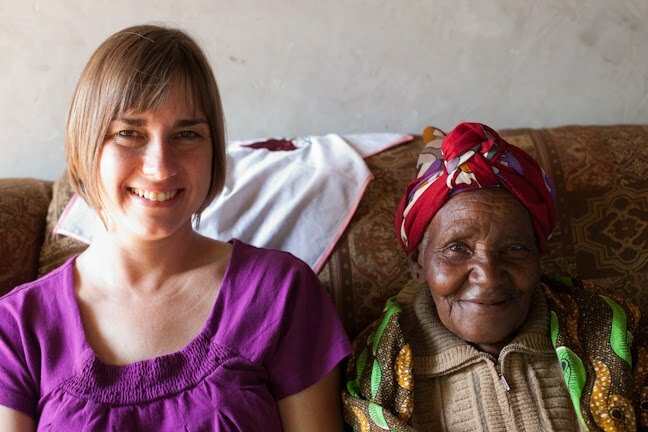 In Tanzania, someone who is your elder is offered the respectful greeting Shikamoo, which translates roughly to "I hold your feet." Yet the most honored member of her family tried over and over to give up her chair for Heifer staff members. She finally succeeded by leaving the room. When she returned, she sat next to me on the plush couch in her son's new brick home, made possible by the income he receives from his Heifer camels, and took my hand in hers. "Thank you for the camel that gives us milk," she said in her tribal language, translated by Simon Sandilen, a Maasai warrior and Heifer Tanzania's senior logistics officer, who has taught himself many languages. He said she also wanted me to know how happy she was that we would come so far to honor her family's success. Yet this is exactly what my trip was for -- to meet the families who have worked so hard to lift themselves out of hunger and poverty with our donors' help; to share meals and challenges and successes; and to then share them in World Ark magazine with those in the U.S. who have helped make their transformation possible. Now that I'm back in the office, what means the most from the trip are the quiet conversations with Heifer's project participants, the ability to witness in person the sweat and love that has gone into their overwhelming successes, and to hear over and over, at each new site we visited: "This work is my soul," "I have found my life's work," "Heifer saved my marriage and my life," and "God bless Heifer." Many thanks to all my new friends in Tanzania, Heifer staff members and project partners who spent weekends away from their families (and in Country Director Peter Mwakabwale's case two whole weeks!) to help us tell the stories of Heifer Tanzania. I have many more stories to share here, including a closer look at Heifer Tanzania's partnerships with churches and a tire-spinning, dust-kicking look at why 4-Wheel-Drive vehicles are so vital to Heifer's field work. Look for full-length features on camel projects, fish farming and dairy farming in coming issues of World Ark.